Note: Since Mr. Premier is busy preparing to earn his degree in English Studies, I have taken over the duties of writing this campaign journal until his return. 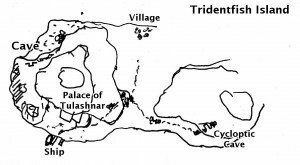 — G. L.
Dissatisfied with the fiasco in the Cycloptic Cave, the procession turned back and marched along the rocky paths of Tridentfish Island to the palace of Tulashnar. Dur Lani was waxing morose, and although some party members considered telling him of the other cavern where they discovered the wormlike statues, they decided not to test his tempers. Arriving at the palace at sunset, the assembled company settled down for an evening of feasting and music, the servants building a makeshift throne for their master and Burzasp, but the festivities were forced and the mood downcast. Night fell on the great pyre before the gates, and everyone was lost in private thoughts as the hours advanced and the men drank. Suddenly, there was a great crash and a piercing scream in the darkness, and a pale servant came running from the palace, shaking and babbling in fear. The bloody remains of another, mangled beyond recognition, lay under a black stone statue that has fallen from the palace battlements. Looking up, Yar-Shalah spotted a dark form, and shot his arrows, but the large outline disappeared from view with a guttural roar. Dur Lani, sensing adventure, drew his sword and advanced into the deserted interior, Burzasp at his side and the others following in his steps. The great hall was a wreck, and as Dur Lani threw himself aside, another stone colossus thundered down from above. A flash of lightning illuminated the interior of the great dome, and the shape of a bestial great ape with leathery bat wings appeared above the party, drawing the wings around it like a cloak. Spells and arrows rained on it, and it spun and fell amidst the group. Dur Lani, two bodyguards, Burzasp, Santiago and Yar-Shalah ran up a set of stairs, while the cowled Marasura whispered to the mortified servants and soldiers near him: “Hide your face like me, lest it be stolen!” Vifranavaz quickly cast a Light spell and sent it to sweep around the upper reaches, revealing another monstrous ape peering through a crack in the dome from the outside, but disappearing as the glowing sphere came close to it. There was another noise from a wing of empty rooms, like a sack crumpling, and Marasura went off to investigate. From beyond a door, he heard rending noises, then the sounds of something gnawing on meat, and he shuddered, creeping back and calling his companions. They prepared an ambush by the door, while someone snuck into the room through another door and lobbed a Molotov cocktail at the dark winged ape devouring its victim. The monster charged, running into an ambush where it was cut down efficiently and mercilessly. Meanwhile, Dur Lani, Burzasp and the others arrived on the rooftops, next to the massive, deteriorating onion dome and the row of crumbling statues outlined in the moonlight. The beast Vifranavaz had revealed was gone. Yar-Shalah, stealthy and alert, readied his bow and sneaked off to the right, whispering to the others to proceed the other way, in a clockwise direction. He prowled through the darkness, and, suddenly, bumped into something large and hairy. The ape-monster, as surprised as Yar-Shalah, let out a mighty roar and attacked in crazed abandon, hitting with both claws and tearing poor Yar-Shalah into pieces. [It took him from 11 to -7 Hp in one round.] The others rushed to come to his aid, finding the grotesque beast feasting on their unlucky companion’s blood. It rose, and another roar, coming from the dome, announced the arrival of a new opponent, as bloodthirsty as the others. A melee developed, and Burzasp finished the killer ape while the second tried to flee — but Dur Lani, drawing back his bow, aimed and sent a projectile through its breast. The bat-winged horror lost height, struggled desperately, but finally crashed into the ground and didn’t move any further. “A kingly shot indeed, my friend!” exclaimed Burzasp. The battle was over. The party retreated to the bonfire, while Dur Lani and Burzasp discussed their adventure, and how the last ape would make a splendid trophy back in his palace. As for Yar-Shalah, he was carried down and spread out — for now — on a flat stone while the others rested. And so passed the night. The guards were more friendly now that they have fought by the party’s side, and as Marasura played an unpleasant tune on his bone flute, Ambrosius sat down to chat with them. It turned out that Dur Lani has come here to shake off the gloom that came with the death of a friend, who had apparently perished in an orgiastic rite in the temple of Badjul, and his body was carried around the city on a litter as customary for the nobility. Weird deaths have apparently been a thing as of late, since another noble of the traditionalist factions, Khojar Mirza, was found dead and decomposed in his home; and he was only discovered as the vultures were gathering around his tower. Some were speculating that he had been involved in a plot against Mirvander Khan, but the entire situation was a mystery. Steering the conversation away from an issue that might be too discrete, Ambrosius returned to the topic of the disappeared friend: and here was a surprise, as the man, called Djandal Adarfiroz, was described as a man completely identical in description to the magic-user Muzafar. The next morning, the companies went their separate ways. Ambrosius politely bowed before Dur Lani, exclaiming: “It has been a great joy fighting at your side as your warrior, oh Dur Lani!” “Indeed so” — came the self-satisfied answer. 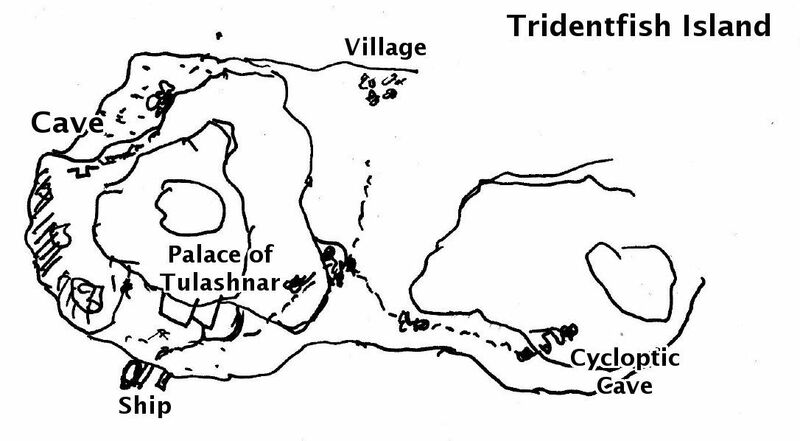 The servants and the soldiers returned to their ship, while Yar-Shalah was left here for the time until the characters went northwest again to their boat and the cavern they had left half-investigated. Arriving at the beach, they spotted yet another sea vessel: a broad, colourful barge was being rowed towards their position, filled to the brim with a ragtag band of unkempt men clad in turbans and colourful rags. As they neared the shore, the characters hid, and only Ambrosius remained by the boat to greet them. Approaching him, two figures rose: one, an old man with a greying beard flashed a gap-toothed grin at the party, while the other, a massive, armoured Northman, surveyed them with dispassionate eyes. “I am Kafir, and who are you?” — yelled the older man. “That is well, for we will help you to safeguard your valuables” — grinned Kafir, and beckoned for the others to follow. Vifranavaz, rising from his concealment, cast his Hypnotic Pattern spell, whereupon all the men except Kafir and the stranger froze at sight of the weird colours. It was revealed on questioning that Kafir and his men were garbage collectors from the City of Vultures who followed in Dur Lani’s path to pick up any valuables they might have left behind; and they were under the charge of Ali Doroml, the Overseer of Beggars. They were let go after Burzasp hurled all their weapons into the sea, while Marasura invoked a dire warning that would be a ruse to foil any pursuers: “Tell those who might ask: Djandal Adarfiroz watches over this island!” Then he turned to the silent warrior, asking for his name, which was Thorlig Jansen. Thorlig was looking for a religious sect, the cult of Kothag, but he did not know, or did not want to talk about more than the fact that it was known for certain mind-reading rituals. After the barge was out of sight, it was time to return to exploring the strange cavern. Descending to the hall with the defeated worm-statues, the characters went left, and up a short flight of stairs to a terrace, then through a tall bronze door into a hallway with yet another statue and stairs descending to the right. The door forward lead into the gallery of a round domed chamber; below, a second statue stood watch over a metal dome sunken into the ground. This structure was inset with a number of glass “eyes” — thick peering portholes or something similar. Some sort of console stood on a metal pedestal. A metal plaque read: “Guaranshawar, The Lord Who Crawls”. A side room off the gallery held shelves with the kind of metal machine parts already seen on the last expedition; opposite, brownish, wizened corpses sat upright in wall niches. It was reasoned that the statue, and probably the corpses would animate if the characters did wrong, so it was decided to attack from a prepared position. Ambrosius and Santiago took one of the heavier machinery pieces and carried it before the statue, while Vifranavaz and Marasura waited outside with a fastened rope, reasoning the statue may stumble with its short legs if it gave pursuit. The machinery piece was swung like a battering ram, and the statue’s body cracked, but it did not topple yet, coming at the characters at unexpected speed. The two adventurers ran out, and a melee developed, as the stone idol somehow did not get entangled in the rope. Eager to stay out of melee, Vifranavaz snuck in, but he halted in his tracks as he found himself face to face with two brownish corpses, who did animate after all; two sets of sharp claws sent him down, bleeding. The monsters came at the able combatants, but they stood their ground, Thorlig dropping his opponents like flies (once hitting for 42 Hp with a lucky critical hit). Everyone was badly wounded, so it was decided that Burzasp, Thorlig and Santiago would do some reconnaissance to the right side of the building exterior (down the stairs guarded by the first two statues) and return if they found trouble. 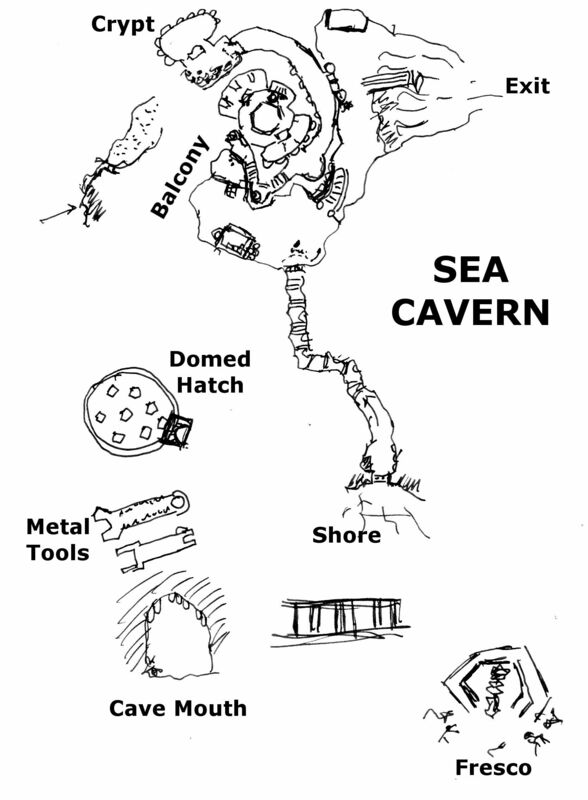 What they found was an underground bay, the source of the rolling waves; a badly decayed pier reached into a deep underground pool, and a tunnel lead outside, presumably towards the sea. A set of double bronze doors guarded an extra entrance into the building, flanked by two pedestals with a statue on one of them, while a storage shack to the side of the cavern contained items of little interest. The tunnel could be a new way into this place, as well as a place to hide the boat from the likes of Kafir’s gang, so the next objective was finding the way in from the outside. Fortunately, there was no more need to trust the sea blindly: Thorlig was an old deck hand, and the characters soon started rowing clockwise around the island. 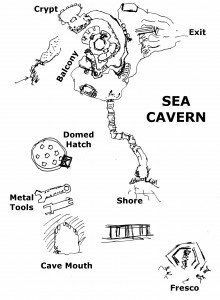 Another hour passed, and finally, at low tide, a cave mouth opened, with a twisting passage back to the pier and the underground lake. The worm-idol was still standing watch by the gate, but a coil of rope brought it crashing down, where it was set upon and destroyed. The entrance lead to a wider, decorative corridor running in a semi-circle; to the left, it lead to a niche with a weird fresco and a room opening into the domed room; to the right, it tunnelled into the bedrock until it arrived at an arch forming an open mouth full of teeth. After some probing, one of the teeth proved to be moving; Ambrosius leaned closer, but to his bad luck: he got a gust of flame in his face. Thorlig, the next one to make an attempt, tried to sneak under the archway, but triggered a pressure plate, getting more fire and retreating immediately. Burzasp, not to be outdone, selected an entirely different strategy: he made a run for it, jumped… and landed smack dab in the middle of the arch, receiving a full blast of fire. Instead of sprining back, he lunged forward into the next room. Several ceramic bowls by the walls contained ashes, soot and blackened bones; an interior room was a sort of crypt with more ashes and several soot-covered skeletons slumbering in their wall niches. While Burzasp returned to report on this finding, Ambrosius triggered the flame trap a few times with a large stone, figuring it would run out of fuel after a while, and it did. This allowed Thorlig to join Burzasp. He immediately spotted a valuable necklace around the neck of a skeleton, and took it. He was soon seen retreating from the room, swearing loudly as he was trying to hold back a horde of 24 skeletons attacking with their claws and whatever they could find – but they were no match for a band of six adventurers, and were easily defeated. There was one more direction to go, the domed room. Using the previous method, the worm-statue was ambushed and destroyed before it could offer much of a reaction, and the console, as well as the metal dome with the glass portholes in the floor, was for the characters to play with. The machinery of the console was inscrutable, but there were clearly four round slots in it. Of course! Someone immediately suggested that on the last expedition, they had found large clay jars with ceramic rods being suspended in some kind of jelly — might these objects fit the slots? And then what? But curiosity was stronger than the instinct for self-preservation, so Burzasp, standing by the console, slid each rod into the pedestal one after the other. There was a steady hum; the room shook and machines deep beneath the party’s feet rumbled alive. The metal dome rose, releasing clouds of icy mist with a long hiss; beams of light painted the walls and ceilings. There came a response. Something moved down there in a pit of metal machinery, and with weird undulations, the thin body of a great wormlike entity rose above the metal rim. It had the resemblance of a segmented white earthworm, the body strengthened by several glinting chrome bands around its body, dangerous-looking little tubes aimed at the group. “And how may we aid you further, oh great Guaranshawar?” — asked Burzasp. The metal hatch descended as the white coils disappeared again; lock-bolts fastened themselves until the protective device was again airtight. “It is certainly notable to cross such moral event horizons.” — reflected Burzasp. Original date 3 March 2012.